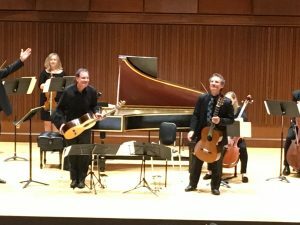 During the common hour on Thursday, September 27th, the Bach Consort of Worcester performed iconic baroque-era pieces using strings, flute, harpsichord and acoustic guitar. The Bach Consort of Worcester is a musical performance group dedicated to the preservation and revival of Baroque-era music. They have been performing since 2010, and are beloved in Worcester and especially at Assumption College, at which many of the members of the ensemble are faculty. HumanArts, a program dedicated to studying and reviving the art, music and history of the past, put on this concert. 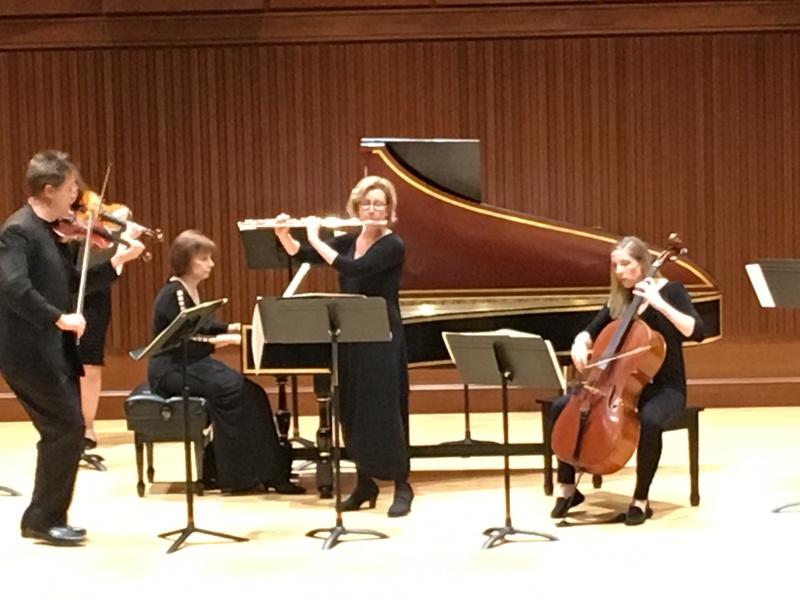 The first three pieces featured were examples of the Concerto Grosso, a musical form that rose to popularity in the later half of the Baroque Period, approximately 1600-1750. The first piece was by a master of the string concerto, Antonio Vivaldi. It featured a quick allegro tempo in the first movement, with some expert harpsichord playing by Assumption’s own Dr. Michelle Graveline. The allegro movement was built out of incredibly fast thirty-second notes, and the crowd was awed as Dr. Graveline’s fingers flew over the harpsichord. The second piece, by Bach himself, really shone during the Affetuoso movement. Traditionally in the second movement in a concerto there is a slower tempo, such as Affetuoso, Andante or Largo. The flautist, Dr. Tracy Kraus and the Concert Master, Dr. Peter Sulski, had lovely tandem parts on the flute and violin, respectively. The third piece was another by Vivaldi, featuring an Andante Pizzicato movement. Pizzicato refers to the plucking of the strings of the violin, viola, cello or bass and is unique because of the rarity of its occurrence within popular classical music. 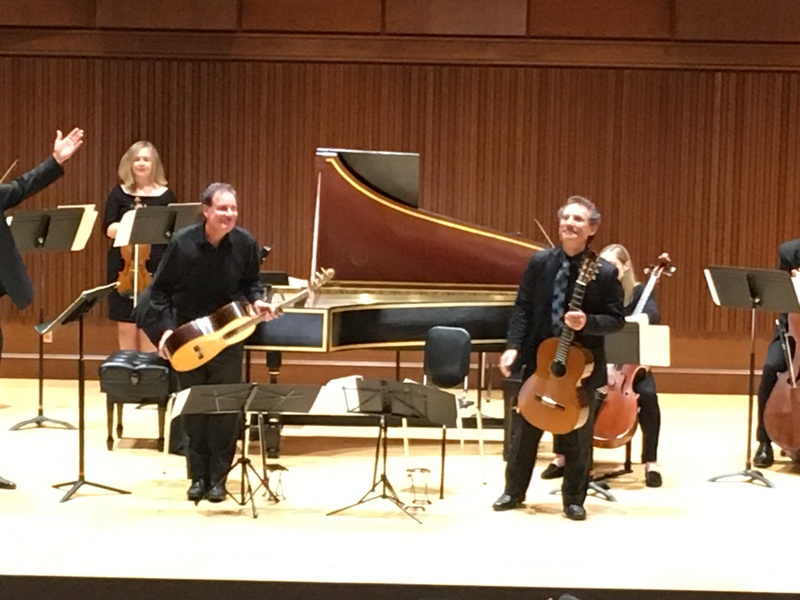 As the violinists and violists slowly plucked their strings in time, world-renowned classical guitarist Dr. Paul Gregory played soft arpeggios complimented by Assumption’s own Dr. Peter Clemente’s expert guitar playing. The final piece featured a complement of five violinists, two violas, one cello and one bass. It featured a work of Felix Mendelssohn-Bartholdi, a composer who bridged the era of the baroque and romantic, much like Mozart. It was in the newer symphonic style and features a single movement that switches between two tempos, in this case Adagio and Allegro. The magnificent strains of the Adagio contrasted and complemented the violent rapidity of the Allegro. When the ensemble bowed for the last time, they received a standing ovation from the entire audience, eighty or ninety students, faculty and visitors to the College. Interested in events like this but couldn’t make it? Don’t worry; HumanArts has a full array of concerts planned for the school year. On Tuesday, October 2nd, the Limburg Cathedral Boys Choir will perform in the Curtis Auditorium, featuring five centuries of great European choral music. On Wednesday, October 10th, there will be an African percussion workshop in Kennedy Hall 112 by Dr. Jeremy Cohen. On the 18th and 23rd of October, there will be common hour concerts featuring Dr. Christopher Ladd on the guitar and Dr. Susan Knapp Thomas on the harp, respectively. 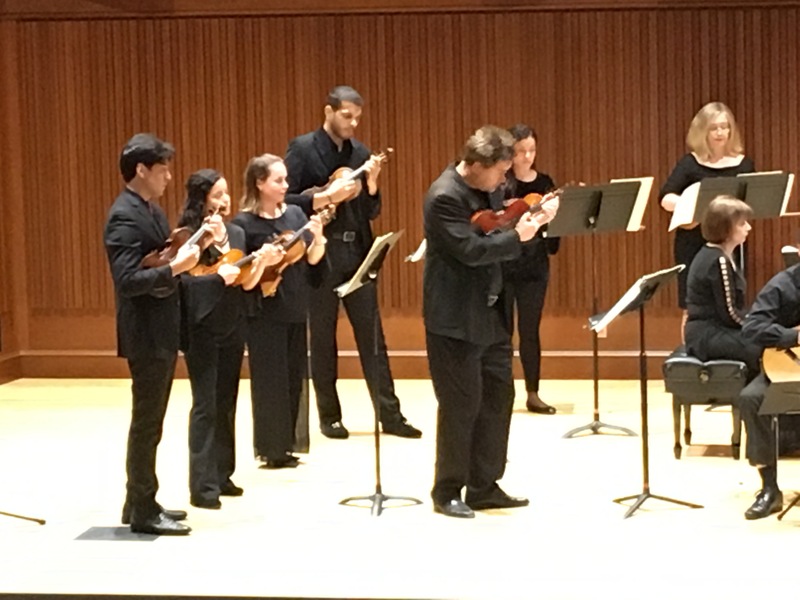 During the spring semester, there will be another opportunity to see the Bach Consort in concert again, performing the Sonatas of J.S. Bach on Thursday, January 24th during the common hour. On the 21st and 28th of February, there will be two more common hour concerts, the former featuring works of Haydn and Mozart, and the latter featuring John Muratore with classical guitar pieces. On the 17th of March, there will be songs and airs of the British Isles at 3:00p.m. Finally, on the 24th of March, there will be a chamber music concert at 2:00p.m., featuring music from around the world. (Unless noted otherwise, all concerts are in the common hour in the Curtis Performance Center.) Be sure to participate in the wonderful musical events Assumption has to offer! It was the newer symphonic style and features a single movement that switches between two tempos, in this case Adagio and Allegro. The magnificent strains of the Adagio contrasted and complemented the violent rapidity of the Allegro. When the ensemble bowed for the last time, they received a standing ovation from the entire audience, eighty or ninety students, faculty and visitors to the College. Jakob Pohlman, a first-year, studies theology. He is a staff writer for Le Provocateur.